:: This post was inspired by my new friend Grumpy Kitty. Be sure to stop by her blog, as she has some good stuff. Hey People! My name is Claudia. I live in Upstate New York. I live my wonderful boyfriend who is amazing beyond words. We have a kitty cat name Carlos. I’ve been doing creative things as long as I can remember. I strongly focused on the arts when I was in high school and some college. I even had some of my work displayed in galleries. I remember participating in competitions and coming out on top. It was a great ride, but that came to a halt when I got a little older. Although life has taken me on many different paths, I have always managed to keep creativity in my life. I always kept drawing, painting, writing, cooking, doing collages in all kinds of mediums…you get the idea. I’m very fortunate to have two wonderful careers. My primary career is in Information Technology. I’ve been doing this for almost 20 years (wow, I feel old). In this career I have done many things. Wed development and design, system and database administration, help desk and training are just the highlights. Currently, I serve in a role where I specialize in Information Security. In this role I am a software engineer and also perform system administration duties. It feels great to work really hard for something that helps people. My second career is in fitness and aquatics at the YMCA. This is probably the longest time that I have held on to a part time job (almost 10 years). Working at the Y changed my life. I currently teach Aqua Fitness (boot camp style classes), and group cycling classes (think Spinning). I also sub other class when I can (kickboxing, step aerobics, body sculpting, etc). I really love working at the Y. So, I guess that wasn’t enough to keep me busy, so I decided to start a new hobby: making jewelry. Now, I’m not going to say that I’m an expert by any means. However, my very strong creative background has really given me an edge. Bead smithing has given me something very positive to focus on and keep me occupied. I currently am only crafting bracelets (because I love them so much), but soon I will be moving to different peices such as necklaces and earrings. We’ll see what happens from there. I have created so many bracelets, and everyone has been raving about them. So, I decided to start an ETSY shop to sell some of my work. If you would, please take a moment to check out my shop. Thank you for taking the time to visit my blog! And don’t forget to check out my girl Grumpy Kitty as well. Grumpy Kitty…that makes me laugh. I got into crafting jewelry and bead smithing because I thought that this would be a nice, affordable and relaxing hobby. I figured that it would help me curb some of my other bad habits, keep me occupied and is an opportunity to channel my creative juices. And it most certainly has! 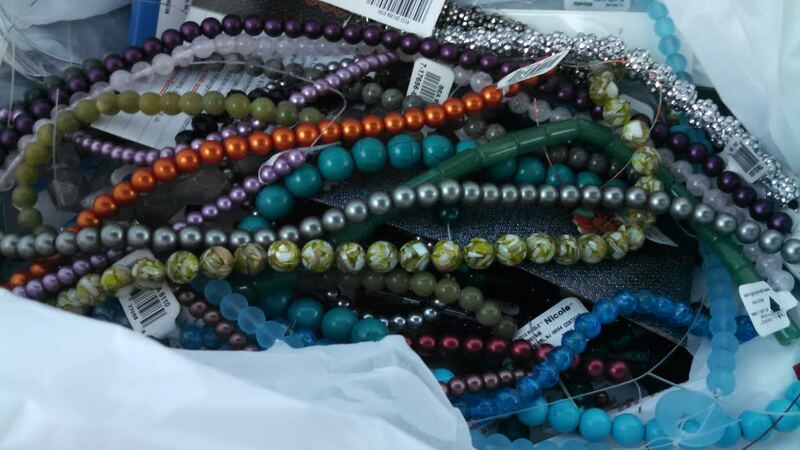 An incident like that will really make one reflect on the approach to bead shopping. I started thinking about this and how I can better strategize bead shopping to get the most bead for my buck. I am by no means good with money at all. But, I do have some tips that will help you save some green. It comes down to 4 key elements: sales, shameless couponing, bulk ordering and free shipping. These would probably be your go-to bead place by default. In my area, we have 3 major craft stores. The trick with these guys is to look for the sales in the Sunday flyer. If you don’t get one in your paper? That’s when it’s time to go online and look to see who is having a bead sale. Most of these places will offer a coupon of some sort. TIP: Go early in the week to get the best of the lot. If you wait, you’ll be picking through scraps. Make sure you picked up the beads that are on sale. Some places try to get slick. I have a love/hate relationship with Amazon.com. It’s so easy to impulse buy for beads and other goods. The nice thing about shopping for beads on Amazon is that you can buy a higher quantity of beads for a much lower price. If you are a Prime member, that’s even better. A good chunk of the orders will be free shipping and arrive within 2 days. Evil, I tell you. TIP: Even if you are not a Prime member, there are plenty of places that will offer free shipping. Better than paying 2.25 on a baggie of loose beads and pay 5 bucks for shipping. Unless a bead specialty store is in your area, it will be hard to spot coupons and sales. I usually think of these places as a treat to visit. Beads everywhere! TIP: Take the time to speak to the store keepers. They are usually very knowledgeable about jewelry making, and if you ask them questions of any kind, they are usually very receptive. If you are bold enough, ask them to point you in the right location for a great price in their store. Most of the local stores in my area have a coupon weekly that says “get ##% of one regular priced item“. Yeah, that’s all fine and good. But one coupon for one strand of beads? There are many shameless ways to get around this. This includes bringing your people with a copy of the coupon so they can buy beads for you, and leaving the store and coming back an hour later with a hat on and a different shirt. This is extreme shameless couponing right here. If I had my heart set on a couple of strands of very choice beads that are not on sale…I would totally do this. Don’t be shy – the worst they can say is NO. Then just say “I’m sorry. I didn’t know I couldn’t do that”, and walk away. Some bead magazines also have online coupons with codes that are included. If you don’t want to buy the mag, browse in the book store to find the codes. Also, never underestimate the power of google. You could always search for coupons and codes for online shops and local stores.